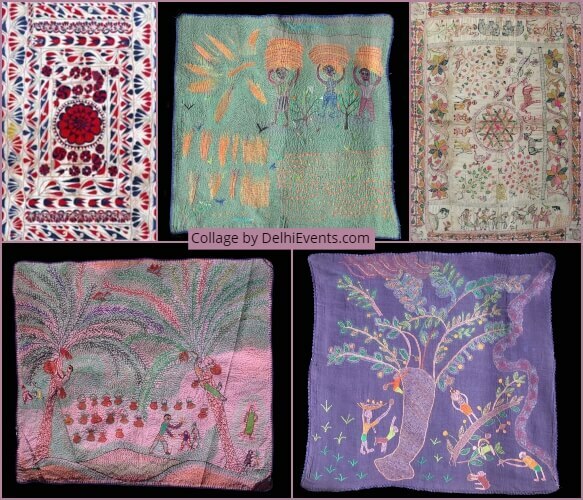 “ It is a world class collection of both traditional and contemporary kantha “, as stated by renowned textile historian. For the first time we are exhibiting an extensive collection for the art and textile lovers of Delhi. Normally one can find a collection like this only in museums. Some of the traditional kanthas have been collected over many years and are part of Siddharth Tagore’s textile collection . The range of works are from pre-partition East Bengal and West Bengal. We are also showcasing some innovative cotemporary kanthas , which have been inspired by Meera Mukherjee’s work. Meera Mukherjee a famous Indian sculptor and writer known for bringing modernity to the ancient Bengali arts. Kantha’s eternal beauty is in its symbol of socio –economic emancipation. Kantha is old but its appeal is new , keeping the magic of the thread work alive today .